A crumb of comfort for current Windows Phone users? Windows Phone 8 might not be coming to current handsets, but there will be new features for Microsoft's current mobile fans. 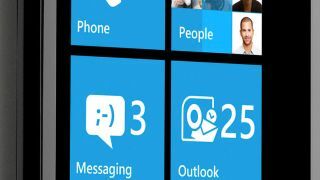 Named Windows Phone 7.8, the new version of the hardware will feature the same new Start screen as seen on Windows Phone 8, giving access to more options for your Live Tiles. This now uses the whole width of the screen, without the arrow to tell you to swipe sideways for more apps to clutter things up. With the extra space you can fit in a lot more tiles, which can now be three different sizes. There's a new small size that you can pick for any app, so if you don't need the Office hub or the dialler to have a full size button because there's not that much useful information on them, you can shrink them down. And as well as the current standard tile size, any app will be able to have an extra-large tile to fit more details onto the live tile – plus new colour schemes will be on offer too. We've not got any information on a Windows Phone 7.8 release date, but Microsoft is currently in talks with operators and handset manufacturers with regards to testing the update. However, there will be a way for users to get their hands on the updates earlier through Microsoft, as long as responsibility is assumed for anything going wrong – which will help stop a situation like Google's Android fragmentation.